With temperatures cooling down, it's time to put the sandals and sneakers away an opt for something better suited for the season: boots. A quality pair of boots should be a staple in anyone's closet. They can be dressed up, dressed down, worn inside and outside, keep your feet warm, provide ankle and insole support, and most importanly, help you look sharp and manly at the same time. John Cho Moore creates men's bags and briefcases from sturdy canvas, leather, and shaped bamboo. Really. As Michael of Those Who Make says, "After working for companies that embraced a disposable state of mind, John aimed to create a product that would get better with age. Follow along as John utilizes durable, quality materials – waxed canvas, leather and bamboo – to craft a timeless bag." The American Craftsman Project is a new series by Tadd Myers, dedicated to capturing, honoring, and celebrating the work, skills, and products created and built by true craftsmen and artisans. With the evergrowing ubiquity of smartphones and tablets, designers and makers are having a ball coming up with ways to infuse some custom, handmade warmth to these digital devices. We've seen lots of smartphone/wallet combos before, but none have tempted my checking account like these designs by SakatanLeather. "I think we're all done with living in a disposable era. Most people are seeking out quality that comes from our country." So begins this fascinating and, (I'll say it), hopeful look into the process of making sturdy, well-made and hand sewn shoes and boots from Oak Street Bootmakers, which are designed in Chicago and handcrafted in Maine. Simeon from Two Lives Left just snagged a new iPad 3, and with it, a warm leather smart cover. He says, "I’m not too careful with my cover. I chose the leather cover thinking the more scuffed and damaged it got, the better. I wanted it to look worn. Unfortunately after only two weeks of use it did start to look worn — on one side only." The asymmetry simply wouldn't do for Simeon, so he decided to give his leather the worn-in look he was hoping it'd develop. So, he stained it. With coffee. Have you ever wanted to put your laundry away more? Designer James Plumb came up with this stylish, masculine dresser for the Salone 2011 at Galleria Rossana Orlandi. His frame is made from iron, but I'm thinking this design could easily be translated to a DIY effort. I know. For many, the era of the cell phone has rendered the wristwatch useless for some. But not me. I'm an enternal watchwearer, forever doomed to feeling naked without that one accessory that must stay on me. I may be used to the weight, may just not like the look of my bare left wrist, or perhaps I'm just obsessive enough that I need not to have to pull something out of my pocket to know what time it is. (It's that one). Quick story...which I've probably already told somewhere on ManMade before, but I can't seem to find it. I packed my lunch every day when in school, from first grade to my final senior exams. Well, rather, my dad packed my lunch for me. It was something we shared, and one of the greatest gifts my father ever gave me. In elementary, I was one of only four or five kids who got to line up early because we weren't lunch ticket users. The "packers" always got teased for some reason (kids are weird), but I also felt kinda cool and special. For years, I've been saying [to myself, and probably to you at some point] "Man, I need to learn how to work with leather." I mean, that's like the historic manly craft, right? I kinda have to. 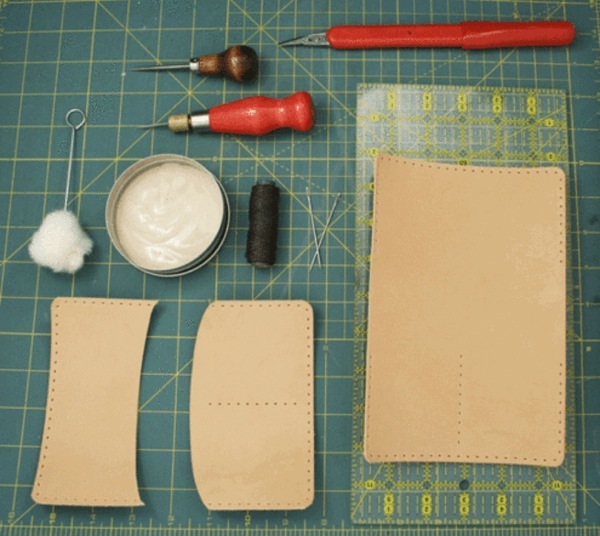 Well, I believe I've found the project that's gonna get me there: this custom leather travel wallet project by Jepsen LeatherGoods. We love the idea of putting something cool and digital, like a CD, inside a rustic, hand-hewn leather home. As the designer and author Elizabeth says, " This is an instance when my excessive love for prettiness wins out over practicality, utility, and common sense. I already had a CD case - a perfectly good one I'd had since high school. But its cover was nylon and plastic and - well, not hand-tooled leather. This is a makeover, and an impractical one at that - not a made-from-scratch project - but it sure is nicer to reach for a 'How to speak Italian' CD in the car now."